During my journeys into DIY audio I have, as a general rule, spent rather little of either my time or my money on bits of wire for my system. This is mainly because I start from a rather sceptical place when it comes to the audible effects of cables in systems. It's not that I am convinced that there is no difference - by any means - but that I feel that the situation is very much more complex than that claimed by most manufacturers, retailers and reviewers. Apart from this, I've been concentrating on getting the electronics and the user interface of my system to my own satisfaction, before I have the confidence to start messing around with cable testing. It's routinely asserted that the only relevant parameters of an audio cable are its resistance, its capacitance and its inductance. It is true that these define the general "frequency response" of the connection between two pieces of equipment, in combination with the appropriate output and input impedances. It is also true that "skin effect" and transmission line effects are only really significant at frequencies much above 20kHz, as are the effects of the distributed capacitance and inductance of the wire - at least when connected to normal electronics, anyway. On the other hand, it's clear that the modern urban environment is awash with energy at frequencies outside the nominal human hearing range. It's also obvious that many pieces of audio electronics behave particularly badly when presented with high-frequency signals, whether at their legitimate inputs or elsewhere, for instance through the power supply, or directly into the negative feedback loop via the output terminals. This is the reason some amplifiers pick up radio stations, even with their inputs shorted to ground. Most commercial amplifiers have an inductor in series with the output to prevent this, but some manufacturers claim that this has a negative effect on sound quality, so insist that their amplifiers be used with only certain (usually their own brand) speaker cables. As a particular example, Spectral's dealers only sell their amps with special (expensive) cables from MIT, with beautifully potted and packaged compensation networks halfway along them. This is also perhaps the reason why cables with different geometries seem to behave differently - the "skin effect" may be irrelevant at nominal audio fequencies, but it will certainly affect how the wire responds to radio frequency noise. On top of this, more than a few amplifiers become unstable at high frequencies when faced with unusually capacitive loads, either in the form of electrostatic loudspeakers or some exotic (e.g. ribbon) speaker cables. The noise performance of an audio system can be strongly affected by the choice of cables, particularly those at the inputs of high-gain stages. This is true not only in terms of hum pickup from mains wiring, but also because amplifier input stages are generally capable of demodulating radio signals, and even microwave frequencies from mobile phones. Ben Duncan (EWW, April 1995) argues that this is potentially important because of the limited slew rates of most commercial amplifiers. This is perhaps why it is often claimed that screened cables sound different from unscreened ones, even if the effect of the extra capacitance is probably negligible. This is also one possible reason for the success of Kimber Kable, with its low inductance braided construction. There is also an argument for the use of screened speaker cables (Cyril Bateman, EWW June 1997). The JPS Superconductor interconnects, with their solid copper sleeve, have often been praised for their "quiet" and "smooth" sound; this may well be due to their comprehensive rejection of RF noise. There are other measurable phenomena relevant to cables, including microphony and dielectric absorption, but the audibility of these are not well established. Ben Duncan has measured dielectric absorption in polyethylene insulation on speaker cables (EWW, ?) It does seem to me that it is sensible, all other things (such as cost!) 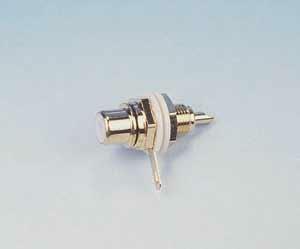 being equal, to use high-quality insulators with low DA, for instance PTFE, and to aim for high mechanical robustness and low microphony in cable construction, as is of course routine in the professional sound community. Building interconnects and speaker cable with these characteristics is not particularly expensive. In the high-end audio cable industry, by contrast, large premiums are regularly exacted for just these factors - the notorious Kimber Black Pearl is just one example. Further down the trail, there is a whole minefield involved in conductor geometry and materials. Copper? Silver? Gold? Silver-plated copper? Should the conductors be solid core or multistrand? Are there any diodic effects between adjacent conductors? How important is the presence of surface oxidation? Should one use silver solder? Again, at least some of these are definitely measureable, but their audibility may again depend on the environment and context that they are used in. This is a hugely contentious area of discussion within the audio community, with a wide spectrum of beliefs from "only R, C and L matter" to "I can hear the difference when I suspend my speaker cables off the floor with string". What is indisputable is that large sums of money are being gained from the business of selling high-end cables, and at least some of the claims of the cable industry are highly suspect. The bottom line is that "cable sound" is a complex issue, and it seems unlikely to me that a particular cable has a sonic attribute of its own, beyond what can be attributed to its first-order electronic properties, independent of what is attached to each of its ends. I haven't even touched on mains cables yet. I suspect that the standard sceptics' argument that the effect of a metre or two of flex between the wall outlet and the electronics should be irrelevant compared with the tens of kilometres between substation and the house is a red herring. It is certainly true that the quality of domestic ring circuits is generally appalling, with a multiplicity of screwed (in more than one sense) connections between a typical outlet and the consumer unit, leading to the accepted advantages of a separate spur for the audio equipment. However, in our digital age every part of the electrical system is exposed to the pervasive hubbub of high frequency noise, particularly near digital audio equipment and computers, and the common-mode rejection of the default three-core mains cable is pretty small. The passage of noise in the opposite direction is also a potentially serious problem, particularly switching spikes from the power supplies of large power amplifiers, and some sensitive audio circuitry may well be affected by this. There was a rumour a few years ago that the Lingo turntable power supply for the Linn LP12 was designed expressly to upset the amplifiers made by the rival company Naim, so that Linn amplifiers (presumably with more immunity to noise on the AC input) would sound better in demonstrations. The solution appears to be a combination of proper maintenance of the mains wiring and connections, high-quality, high-current mains leads and a certain amount of attention paid to filtering at the mains inlet of any electronics. There is also anecdotal evidence that shielding mains cables can improve sound quality, although I suspect that a combination of appropriate cable geometry and filtering is a more reliable and systematic remedy. Here are a few links to interesting discussions of some cable issues from right across the community. I have deliberately avoided any specific personal comments on these! Nelson Pass on termination of speaker cables. Pete Goudreau's fascinating article on interconnects and RF interference. Ben Duncan has also conducted some interesting experiments on phase distortions in speaker cables (Hi-Fi News, July 1999). 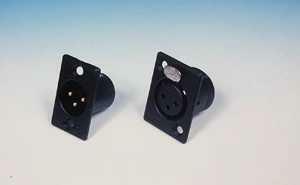 A few manufacturers, notably Naim, install DIN connectors as standard on their electronics. Not only does this make their equipment awkward to wire up to anyone else's, but I have always associated DIN connectors with cheap tape decks. They are flimsily constructed and hard to take apart and put together, while I'm not convinced they offer much of an advantage electrically over RCA phonos, apart from their reduced propensity for contacts to pull apart inadvertently. Conversely, I've always had a good feeling about XLR connectors. The fact that they are the recording industry standard, together with their solid construction and the ability to lock them together, inspire confidence. They also bolt firmly into the chassis. I like the three-pin connection, which I always felt was the right way to connect two audio devices, whether balanced or not. The two polarities of the signal and the independence of the chassis ground from the signal ground within the connectors make the choice of grounding scheme the responsibility of the equipment designer, rather than an arbitrary constraint. I use the black finished XLRs from Neutrik, which I buy through Maplin here in the UK. I prefer these to the cheap unshielded plastic ones that Maplin sell for less than half the price, and the black finish, even though more expensive than the default silver, matches the boxes in my system (do I hear cries of "boring!!"?...). This is an interesting little project for a cheap interconnect based on Cat 5 computer network cable. A year or so ago I found about three metres of network cable in a waste basket at work, and although I couldn't think of any audio application for it, it looked interesting so I took it home and put it away for safe keeping. Recently I wanted some balanced interconnects for my new balanced preamp project, and I found Gary's article on the Vinyl Zone site, and I was glad of my serendipitous acquisition. Gary uses the cable single ended, but the twisted pair construction lends itself easily to balanced connections. I put these together exactly following Gary's very clear instructions, apart from my choice of XLR rather than phono terminations, and had no problems. They are really cheap to make - with mine, the connectors were easily the costliest items, followed by the heatshrink. I hadn't come across the PTFE plumber's tape before, which is an extremely thin (0.075mm) and quite stretchy tape used apparently to seal threaded ends on pipework. Although I suspect its electrical effect is negligible, it provides a nice way to bind things together, and also to give a relatively smooth (non-stick, even!) surface to slide the heatshrink over. It's very cheap, too, with a twelve-metre reel - enough for one pair of cables - costing only 27 pence. The result was a couple of pairs of 60cm interconnects with a slightly lumpy finish, thanks mostly to the earth wire and the odd join in the foil shielding. I suspect that these balanced interconnects could be improved on by separating the shield and the ground internally, so that the ground lead itself is shielded. This still allows the ground and shield to be connected at the equipment at either end, but should reduce the induced noise in the ground connection, especially if I use them for unbalanced signals. There is an article on the excellent Rane site about this - apparently the AES has now recommended grounding both ends of the shield as a standard. Thorsten Loesch has a fascinating set of projects at TNT audio magazine, including interconnects of all types, mains cables and speaker cables. Allen Wright's Update to his SuperCables Cookbook contains recipes for three exotic interconnects using foil and Teflon heatshrink. Chris VenHaus has a detailed description of his home-made speaker cable and interconnect cables. Jon Risch has recorded his experiences with various DIY cable projects here, with some useful recommendations on materials and geometry.